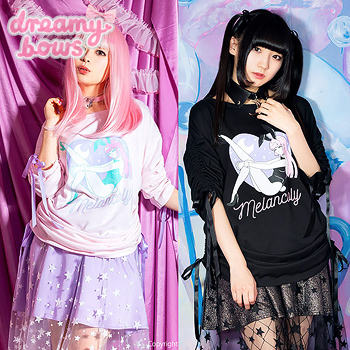 This versatile cutsew is bursting with cuteness and the lace up sleeve and hem detail makes it perfect for popular Harajuku styles such as pastel goth, Moehara and Mahou Kei. This adorable and unique cutsew by Listen Flavor is bursting with cuteness. 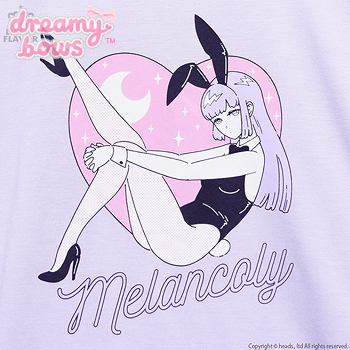 Featuring a anime girl with bunny ears sitting in a moonlit heart, the slogan says "Melancoly" in italic cursive font. 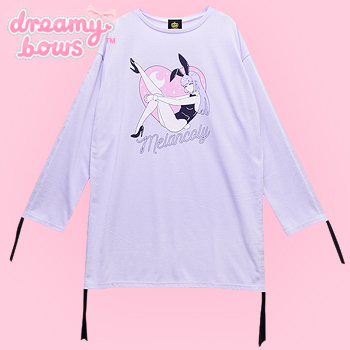 This new cutsew design is super unique due to the adjustable sleeves and hem, the lacing inside allows you to pull up and gather the fabric transforming a standard cutsew into a new style! 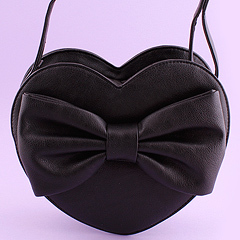 This would look great paired with leggings or a pair of cute shorts or skirt!